There were chances for Clare during an eventful game in Pairc Esler, Newry but they left with a draw to get their first point this year. A David Tubridy goal, in injury time ensured Colm Collins’ side didn’t leave empty handed after Armagh looked home and dry. When Rory Grugan, Greg McCabe, Joe McElroy and Jemar Hall got four answered points, Armagh were 1-13 to 1-9 clear. Tubridy replied with a splendid side line ball but when he repeated the trick on 72 minutes, it managed to find a route over the line. It was the second fortunate goal Clare got but the contest didn’t start like that. Within 25 seconds of the throw-in, Dermot Coughlan went to ground awkwardly ending his afternoon. There was a 12-minute hold up. On 14 minutes, Niall Grimley got the game’s first score. Gordon Kelly replied for Clare after a fine save from Blaine Hughes. However, Clare stopper Pierce DeLoughrey produced two of his own. The teams shared four scores but when Jamie Clarke got a red card, the Banner were in prime position. But it didn’t materialise as Greg McCabe’s Armagh goal finished a period that saw them 1-6 to 0-5 in front on 37 minutes. Clare responded with 1-3 unanswered. Tubridy with three white flags, Gavin Cooney with a hand pass that deflected to the net. The visitors were 1-8 to 1-6 up at half-time but the Orchard County got the first three second half scores. David Tubridy obliged to level at 1-9 apiece but then Cathal O’Connor was red carded. Armagh went four clear but then Tubridy forced the tie. Scorers – Clare: David Tubridy 1-7, Gavin Cooney 1-0, Gordon Kelly 0-1, Kieran Malone 0-1, Dale Masterson 0-1. 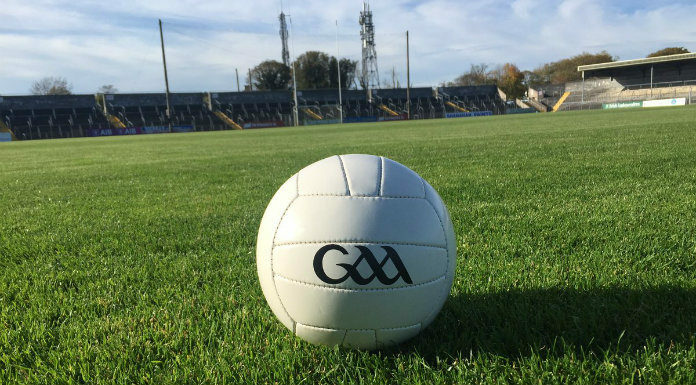 Scorers – Armagh: Greg McCabe 1-1, Niall Grimley 0-3, Rian O’Neilll 0-3, Jemar Hall 0-2, Connaire Mackin 0-1, Charlie Vernon 0-1, Rory Grugan 0-1, Joe McElroy 0-1. Clare: Pierce DeLoughrey; Kevin Hartnett, Cillian Brennan, Gordon Kelly; Conal O hAinifein, Dean Ryan, Dale Masterson; Gary Brennan, Cathal O’Connor; Cian O’Dea, Jamie Malone, Dermot Coughlan; Kieran Malone, Keelan Sexton, David Tubridy. Armagh: Blaine Hughes; Aaron McKay, James Morgan, Mark Shield; Connaire Mackin, Greg McCabe, Aidan Forker; Stephen Sheridan, Niall Grimley; Jemar Hall, Rory Grugan, Charlie Vernon; Stefan Campbell, Rian O’Neill, Jamie Clarke.